MSM... been using it for sixteen years.... great results! Discussion in 'Health Care' started by DennisTate, Jan 19, 2016. Back in 1999 a good friend loaned me a copy of a book written by two research physicians about MSM. I did go through some of the negative consequences of detoxification that they warned about but...... the results were very worthwhile. Has anybody else here been using this for non-toxic and natural pain relief? All cells (and all organelles within cells) are surrounded by membranes. A membrane consists of two layers of molecules situated opposite of one another and consisting of an essential fatty acid on one end, and a sulfur containing amino acid on the other end. The amino acids are interconnected in such a manner that they form a surface into which the proteins and other membrane constituents are inserted and secured. These proteins are necessary for the transport through the cell membrane of many types of nutrients and waste materials. Sulfur bridges form flexible connections between the cells and the surrounding connective tissues. This allows the cells to retain their elasticity. When sulfur is in short supply, the cell wall hardens, and the cells lose their elasticity. The transport proteins of the membrane become locked, and the membranes become less permeable. This results in a reduced transport of oxygen and nutrients into the cells as well as reduced excretion of waste products from within the cells. This causes a shortage of oxygen and nutrients, and an accumulation of toxic metabolic waste products inside the cells. Reduced vitality and eventually degenerative diseases are the result. This stuff is only about ten dollars per bottle at Walmart. I am fairly certain that this webpage is a summary that is written by those same physicians. I suppose that it could be good ol' placebo effect....... but I actually feel significantly happier than I did back in 1999...&#8230; and I do think that this stuff is playing a role in that?!?! Many people using MSM have reported feeling better and stronger and capable of increased endurance. During a test with 14 persons using MSM for periods from seven months to over one year, none of them became ill (3). One stress study involved two groups of 25 goldfish, which were removed from a large aquarium and placed in two identical, small aquariums. One group was fed ordinary goldfish food, and the other group received the same food with 2% by weight of MSM added. Movement confinement, temperature changes and marginal oxygenation stressed the fish in both aquariums equally. After five days, only one fish of the MSM group had died, against 11 (almost 50%) of the control group (3). It is a common practice in intensive cattle breeding to add antibiotics to animal feed in order to promote growth and prevent the outbreak of stress-related diseases. Animal products such as meat, milk and eggs contain residues of antibiotics, which pass into the consumer. The abundant usage of antibiotics is largely responsible for the creation of resistent bacteria strains. Well known examples are the "hospital bacterium" MRSA (meticillin resistant Staphylococcus aureus), and the VRE's (vancomycin-resistant enterococci). Today, increasing resistance of bacteria is considered one of the major threats to human health. It is an intriguing thought that adding MSM to animal feed might reduce stress and improve animal health to a level where the usage of antibiotics can be strongly reduced. Mr. Yehoshua Sofer takes 5000 mgms of MSM daily to hasten healing after injuries. Just Google "Abir Warrior Arts" to see a video about him in action! He has been compared with Bruce Lee.... but he is Breslovian Chassidic Jewish. The brain is extremely sensitive to the effects of toxic materials such as heavy metals and organic compounds. Many of these compounds tend to accumulate in nerve cells where they can cause severe oxidative damage. Neurological disturbances may be the result. MSM is one of the few antioxidants which can easily pass the blood-brain barrier. It prevents and repairs oxidative damage and restores cell membrane elasticity and permeability. This allows the nerve cells to start excreting waste products. The powerful action of MSM is illustrated in the following example. An older woman suffered from poisoning caused by exposure to aluminum. This heavy metal had accumulated in her brain and caused severe neurological damage. The woman had been confined to her bed for six years, unable to communicate with her surroundings. All this time she had not spoken a word. Medical doctors could no longer help her and had given up on her. She was completely dependent on her husband who took complete care of her needs. A natural health care practitioner advised two teaspoons of MSM (about 15 grams) daily. The MSM passed the blood brain barrier, and restored the permeability of the brain cell membranes, allowing her brain cells to purge the heavy metal poisons. Two weeks later, the orthomolecular physician prescribed a warm bath to help her eliminate the released poisons through the skin. After twenty minutes in this bath, the woman suddenly smiled and said "Gee, I feel much better now." These were the first words she had spoken in years. Several months later, the woman was capable of leading a normal life again (7). it seems to improve our mood. This could perhaps be a side effect of the body detoxifying more effectively?!?! Perhaps the most remarkable discovery regarding MSM is that it is an effective pain killer. MSM works for many types of chronic pain. 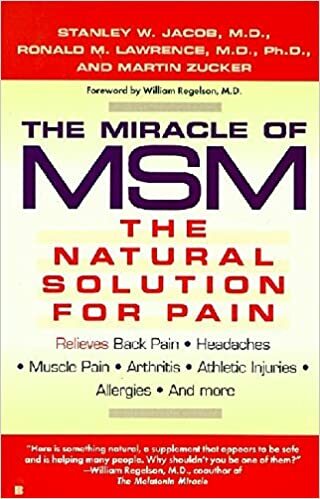 In March 1999, Stanley W. Jacob, M.D., and Ronald M. Lawrence, M.D., Ph.D., published The Miracle of MSM: The Natural Solution for Pain. Their book was based on their experience as medical doctors and MSM researchers. Dr. Jacob is the head of the DMSO Pain Clinic in Portland, OR, and a Professor at the Oregon Health Sciences University, and Dr. Lawrence was the founder of the International Association for the Study of Pain and the American Association for the Study of Headaches. Combined, they have over 20 years of experience with fighting pain with MSM. They concluded that of more than 18,000 patients that suffered from chronic pain, about 70% experienced benefits from the use of MSM, finding that pain either diminished or disappeared altogether. Personal injury due to accidents, burns, etc. Scars due to burns, operations, accidents, etc. You'll get more benefit taking organic sulfur crystals rather than processed MSM. Also, taking silica seems to have many of the same benefits. Two good sources of silica are food-grade diatomaceous earth and bamboo extract. a crystal form....... and is greatly free of additives. Look for something with no fillers or anti-caking agents. I use Kala Health organic sulfur. It is labeled "MSM", but is just the raw product in a one pound tub. Mix it with water. I take a teaspoon at a time. I also take 1 tablespoon of diatomaceous earth daily. My wife takes the bamboo extract to get her silicon. The earth and bamboo seem to work equally well. I've been getting a version of it from B. C., Canada that is Vegan friendly.... and has zero additives. My wife is now taking over 5000 mgms daily and she is encouraging her friends and family to take it as well. I read the following book back in 1999. From my experiences over the least nineteen years every word in this book is as true as we human beings can write. nutritional sugars..... can they assist MSM to be even more effective???? Have you heard of more agressive ways to get heavy metals out of our bodies?